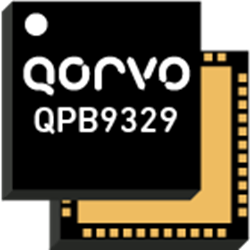 Qorvo offers the new QPB9329 highly integrated front-end module with operation in the 3.8 – 5.0 GHz frequency range for TDD base station, wireless infrastructure, small cell BTS, and pre-5G/5G massive MIMO applications. This LNA module integrates a two-stage LNA and a high power switch in a dual-channel configuration. The QPB9329 provides 1.8 dB noise figure for operation in the receive mode, and 1.0 dB insertion loss for operation in the transit mode. It utilizes Qorvo’s high performance E-pHEMT process, while the pin-diode based switch supports input RF power signals with up to 5W average power assuming 8 dB PAR. The module is packaged in a RoHS-compliant, compact 7 mm x 7 mm surface-mount leadless package. Download the datasheet for more information on the QPB9329 dual-channel switch LNA module.